It did not go well. From the beginning there was disagreement within both the committee and the FCC as to the proper scope of the mission and the committee soon devolved into two opposing and roughly equal camps, with pay-TV providers and equipment makers on one side, and CE makers and technology companies, along with consumer advocates, in the other. In broad strokes, the first camp wanted to focus the discussion narrowly on the technical aspects of downloadable security, while the latter camp sought to focus the discussion more broadly on the goal of “promot[ing] the competitive availability of navigation devices” including security and non-security elements of pay-TV service. While no injuries were reported the debate got pretty intense at times (examples of the jousting can be seen here and here) and in the end consensus proved impossible. Instead, the committee issued a pair of conflicting and mutually exclusive proposals for content and network security, on which the FCC is now seeking comment and ultimately will have to adjudicate. Promoting the availability of competitive navigation devices that could effectively replace operator-provided set-top boxes has been the goal of Congress and the official policy of the FCC since 1996, when Congress passed the Telecommunications Act, which directed the FCC to find a technical solution that would allow retail set-top boxes to interoperate with pay-TV services’ conditional access systems. The result was the CableCARD, which filled a niche but fell well short of fully solving the problem and was not widely adopted in CE devices apart from TiVo DVRs. More recenlty the FCC has focused on downloaded security that would enable any set-top device to connect with and navigate any pay-TV service, regardless of type, by downloading the appropriate conditional access and content security software. But efforts to develop a downloadable security standard have largely been thwarted by pay-TV operators. As recently as 2010 the late Steve Jobs noted that pay-TV operators’ control over the set-top box remained the biggest obstacle to developing a competitive TV product. Jobs later famously claimed to have “cracked” the problem, of course, but if so he apparently didn’t share the secret with anyone at Apple before he passed away because the company has made very little progress in TV in the four years since (we’ll see what happens next week when Apple is expected to introduce its next-generation Apple TV set-top box). In this System, MVPDs would provide a new set of interfaces to their service to allow the user interface (UI) on a retail device to differentiate itself from the UI provided by the MVPD and enable new innovation. Additional service features could be supported by widgets to be developed by all MVPDs and delivered through an enhanced Man Machine Interface (MMI). These could support unique consumer interactions, communication with MVPD network “back office” components, billing, and certain service features. Hyperlinks inside an expanded MMI widget could support targets on the greater Internet to communicate directly with an MVPD web service. [The apps would] enable MVPD supported retail devices to receive multiple MVPD and OVD video services with the CE user interface controlling the device, and the MVPD/OVD video provider’s user interface controlling the service. 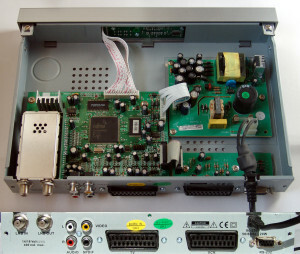 The app model allows the applications to connect to the many different parts of each network involved in delivering service and still take advantage of each networks’ efficiencies, which vary based on architectures optimized for their different physical natures (RF over coax, twisted pair copper, light signals over fiber, wireless RF). This system hides the diversity and complexity of service providers’ access network technologies and customer-owned IP devices and accommodates rapid change and innovation by both service providers and consumer electronics manufacturers. CE makers argue that such an approach would reduce their devices to dumb terminals for running pay-TV operators’ apps, limiting the potential for innovation. There is no certainty at this point that the FCC will act on either of the proposals. It might simply stick to adopting the technical elements on which the two camps largely agreed, such as how services should connect to devices, support for multiple conditional access and digital rights management systems and the elimination of the requirement that all STBs contain an RF tuner, and leave the non-security elements for another day. On the other hand, the FCC is already pretty far down the road toward rewriting the basic rules of the pay-TV business, from retransmission consent to who qualifies as a multichannel video programming distributor, so a move to tear open the set-top box and use it for parts is not out of the question. Comments on the DSTAC proposals are due October 8th.